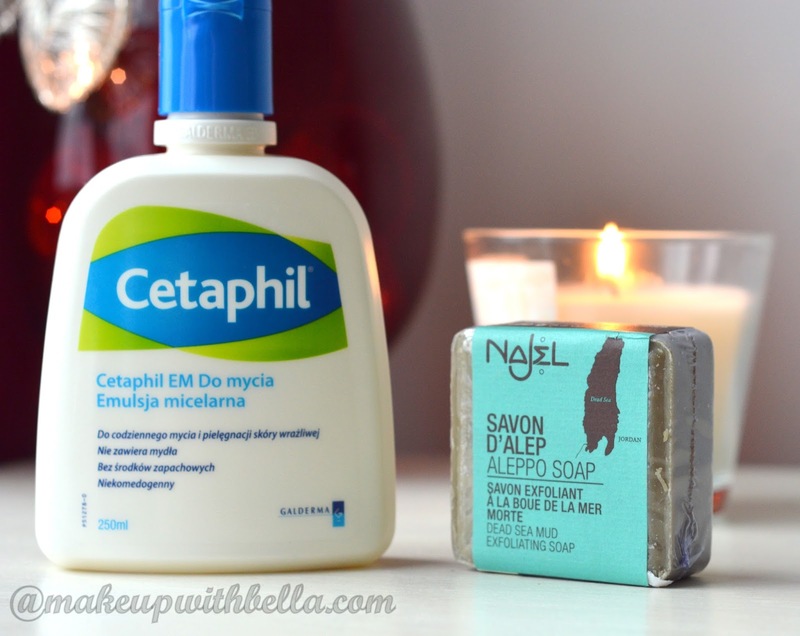 Makeup with Bella: The bits and bobs from Poland- part I- beauty care products! The bits and bobs from Poland- part I- beauty care products! Today I come to you with some goodies form Poland :)! I was on the weekly holiday in my country and I bought a few things! At the end of it, the Xmas is coming, so why not make yourself a gift! 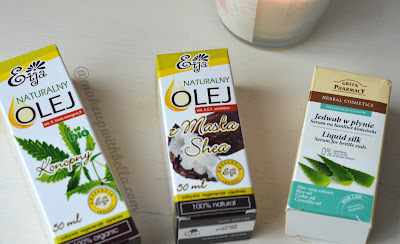 :) I divided into two parts and today I share with you my new beauty care products. 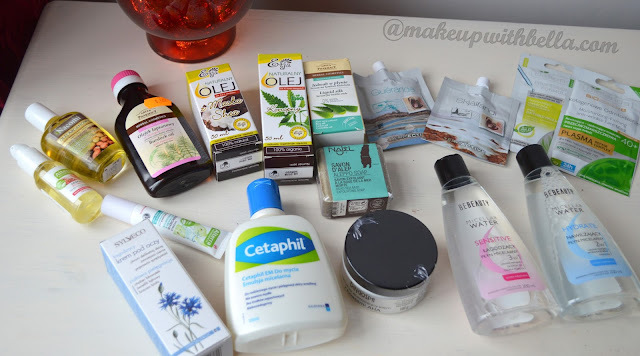 The second part with beauty cosmetics will show up in next post! 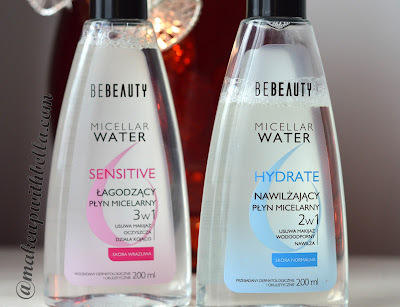 BEBEAUTY MICELLAR WATER, HYDRATE, 2 IN 1 for normal skin and sensitive. Polish ladies may know this product, it's from "Biedronka" and it's affordable, removes beautifully eye and face makeup. CETAPHIL GENTLE SKIN CLEANSE- never had it before, so has to try it. NAJEL, SAVON D'ALEP, ALEPPO SOAP, DEAD SEA MUD exfoliating soap. SYLVECO, SOOTHING EYE CREAM- love this cream and need have one more in my stock. You can check my opinion about it here. 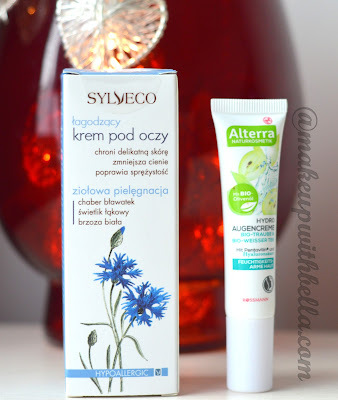 ALTERRA, HYDRO EYE CREAM, grapes and white tea BIO. ETJA, BIO CANNABIS SATIVA (HEMP) SEED OIL with vitamin K and acids omega 6,9. ETJA, BUTYROSPERMUM PARKII SEED OIL. GREEN PHARMACY, HERBAL COSMETICS, LIQUID SILK, serum for brittle ends. ALTERRA, FACIAL OIL- Pomegranate BIO. NACOMI, ARGAN OIL, 100% natural in glass bottle. GREEN PHARMACY, BURDOCK OIL WITH HORSETAIL, against hair loss. BINGOSPA, SKIN PERFECTING NIGHT CREAM WITH AHA ACIDS- used it some time ago, needed get another one. TERRACTIVE, The Icelandic mud mask with seaweed. TERRACTIVE, Breton mud mask. BIELENDA Moisturizing-Firming Anti-Wrinkle Face Mask Mature 40+ Combination Skin. 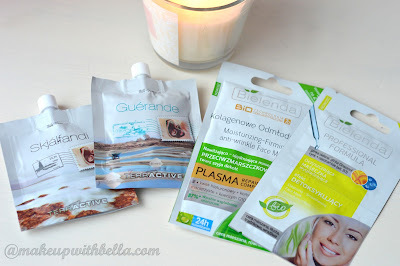 BIELENDA, PROFESSIONAL FORMULA cleansing and smoothening mask detoxifying effect for mixed, oily, sensitive acne and prone skin. That's it dolls, maybe some of you have had hands on some of these bits? Comment below, please. 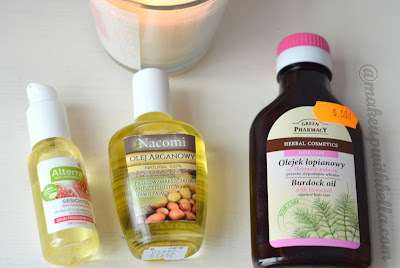 Uwielbiam płyn micelarny z BeBeauty ale tylko ten niebieski. Różowy szczypał mnie w oczy.